It will be up to the new staff under new head coach Steve Sarkisian to develop Marcus Martin's replacement at center. One of the most unlikeliest of dominoes to fall fell on Friday morning when USC’s All-Conference center Marcus Martin announced via Twitter that he would forego his senior year and enter the 2014 NFL Draft. 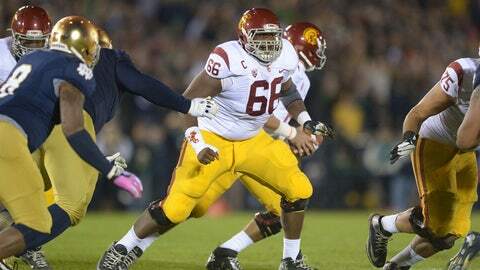 In what is no doubt a surprise, the loss of Martin is a huge blow to the USC offensive line. With Martin declaring for the draft along with the graduation of starting right tackle Kevin Graf, the team will now have to replace two members of it’s starting offensive line in 2014. Similar to what they did with Martin a season ago, the team will have to develop a center in the offseason. Martin started 13 of USC’s 14 games this season. He missed last week’s bowl win over Fresno State with a knee injury suffered against UCLA in the regular season finale. With Martin out of the lineup, the staff elected to go with sixth year senior Abe Markowitz in his place. It will be up to the new staff under new head coach Steve Sarkisian to develop Martin’s replacement. Immediately, freshman Khaliel Rodgers appears to be the top candidate going into spring practice. There hasn’t been much heard from Cyrus Hobbi at that position since USC’s loss at Stanford in 2011, and right guard Max Tuerk has also received some reps at center in the past, but may have found a home at guard. Martin is the second USC underclassman to declare for the draft, as junior Dion Bailey made his announcement earlier in the week. Tight end Randall Telfer announced he will stay for his senior season.